It’s official: I want to move to Black Dog Bay. No, I’m not nursing a broken heart and in need of the Better Off Bed and Breakfast or the Eat Your Heart Out bakery (scratch that—I’ll never turn down a bakery). This tiny seaside village is simply the most charming place imaginable, and after reading Put a Ring on It, Beth Kendrick’s third book set in the coastal Delaware town, I’m ready to book my fictional plane ticket and settle down in this fictional hot spot. Put a Ring on It introduces us to Brighton Smith, a play-it-safe, follow-the-rules insurance actuary who is perfectly comfortable with her not-so-exciting suits, her not-so-exciting job, and her definitely not-so-exciting fiance. When her fiance tells her that (whoops!) he married someone else on a whim, Brighton’s perfectly planned life takes a detour— a detour that involves a trip to Black Dog Bay and a spontaneous, drunken marriage to the town’s designated rebound guy, Jake Sorensen. (What else do you expect when there’s too much champagne and a guy who looks like a lost Hemsworth brother?) But when what started out as a temporary in-your-face act of rebellion begins to feel like something real, Brighton must grapple with why Jake married her, why she so willingly agreed, and why her old predictable life doesn’t feel so appealing anymore. From the second I picked up this book, I couldn’t put it down. (Good thing I started on a weekend.) 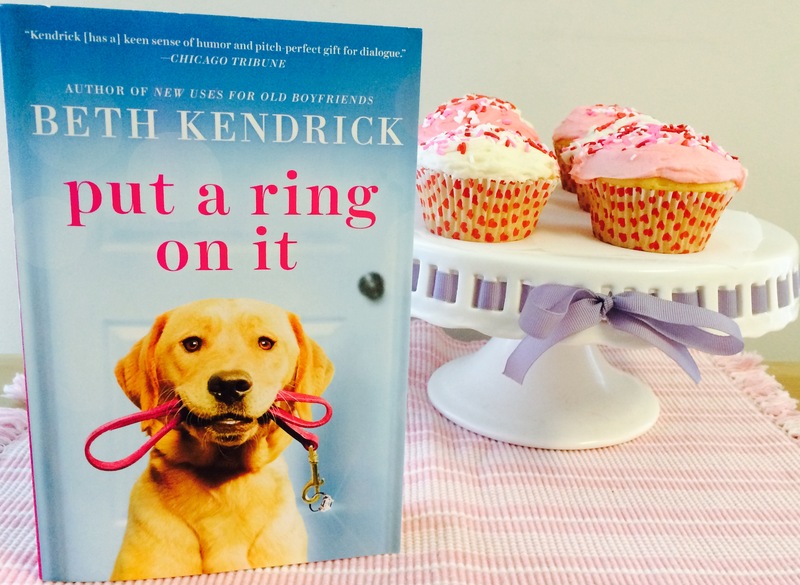 One of Beth Kendrick’s greatest strengths is creating endearing, flawed, completely lovable characters that you never want to stop hanging out with, and Put a Ring on It is chock full of them. I adored everything about Brighton from the very first page—her neuroses, her inability to hold champagne, her obsessions with statistics and antique jewelry. As far as Jake Sorensen goes, I was a complete goner from the second he appeared. A minor character in the previous Black Dog Bay books, I was so glad to see him front and center here. The man is basically Friday Night Lights’ Tim Riggins, if Tim Riggins were a self-made multimillionare with houses all over the world. I could read six thousand more books about this town and Jake Sorensen and never, ever tire of either of them. From start to finish, Put a Ring on It was filled with so much heart, so many laughs, and so many romantic moments that nearly made me burn my dinner because I just had to finish this chapter. Fans of Cure for the Common Breakup and New Uses for Old Boyfriends will be happy to reconnect with favorite Black Dog Bay residents like Lila Alders and Summer Benson while falling in love with the new kids in town. You don’t have to read the first two books in order to dive into Put a Ring on It­—they’re all stand-alone stories—but if you love great characters, great writing, and flat-out great storytelling, I don’t know why you wouldn’t. Trust me, the minute you dive into Beth Kendrick’s world, you’ll be searching literary TripAdvisor for a one-way ticket to Black Dog Bay. For more on Beth Kendrick and the world of Black Dog Bay, visit her on Facebook, Twitter, and bethkendrick.com.